Christopher Columbus' portrait, painted by Alejo Fernández between 1505 and 1536. Christopher Columbus is the incorrectly Latinized name of Don Cristoval Colon, the navigator and maritime explorer credited as the discoverer of the Americas. He was sponsored by the Catholic Monarchs and eventually became an admiral for the Crown of Castile. His voyages across the Atlantic Ocean began a European effort at exploration and colonization of the American continent. While history places great significance on his first voyage of 1492, he did not actually reach the mainland until his third voyage in 1498. Likewise, he was not the earliest European explorer to reach the Americas, as there are accounts of European transatlantic contact prior to 1492. Nevertheless, Columbus' voyage came at a critical time of growing national imperialism and economic competition between developing nation states seeking wealth from the establishment of trade routes and colonies. Therefore, the period before 1492 is known as Pre-Columbian, and the anniversary of this event (vd. 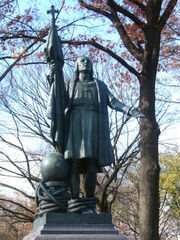 Columbus Day) is celebrated throughout the Americas and in Spain and Italy. However, as the legacy of colonialism in the Americas is today viewed somewhat more negatively than in the past, Columbus has become a divisive figure. 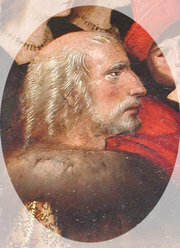 Christopher Columbus, conjectural image by Sebastiano del Piombo in the Gallery of Illustrious Men (Corridoio Vasariano), Uffizi, Florence. 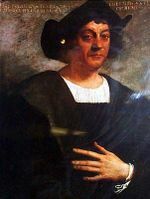 The identity of Columbus is still unknown for certain, although it is most widely accepted that he was of Italian ancestry since he maintained this ethnicity throughout his life. More specifically he is believed to have been from the Republic of Genoa, in Italy , although it has been surmised he could have been from Catalonia, Spain instead. Certainly there were ties between Spain and the Italian nation-states. (King Ferdinand II of Aragon was also the King of Sicily.) His nationality is still debated, and many theories exist detailing his possible lineage. Aspects such as learned languages and DNA samples are being studied although no definitive answer has yet been revealed. According to generally recognized theory, Columbus was born between August and October 1451 in Genoa, one of the most ancient mariner communities of Middle Ages Europe. His father was Domenico Colombo, a middle-class wool weaver working between Genoa and Savona. Susanna Fontanarossa was his mother and Bartolomeo was his brother. Bartolomeo worked in a cartography workshop in Lisbon for at least part of his adulthood. While information about Columbus' early years is scarce, he probably received an incomplete education. He spoke a Genoese dialect of speech . In one of his writings, Columbus claims to have gone to the sea at the age of 10. In the early 1470s, he was in the service of René I of Anjou in a Genoese ship hired to support his unfortunate attempt to conquer the Kingdom of Naples. Later he allegedly made a trip to Chios, in the Aegean Sea. In May 1476, he took part in an armed convoy sent by Genoa to carry a valuable cargo to northern Europe. On August 13, 1476, the convoy was intercepted by Portuguese ships near the Genoa coast. Columbus was wounded in the battle that ensued, but managed to land at the small town of Lagos. Although an abundance of artwork involving Christopher Columbus exists, no authentic contemporary portrait of the man has been found. Over the years, artists who reconstruct his appearance do so from written descriptions. These writings describe him as having reddish hair, which turned to white early in his life, as well as being a lighter skinned person with too much sun exposure turning his face red. Despite the clear description of red hair or white hair, textbooks use the image on the right so often that it has become the face of Columbus in popular culture. Europe had long enjoyed a safe passage to China and India— sources of valued goods such as silk and spices — under the hegemony of the Mongol Empire (the Pax Mongolica, or "Mongol peace"). With the Fall of Constantinople to the Muslims in 1453, the land route to Asia was no longer an easy route. 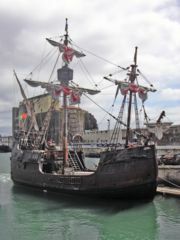 Portuguese sailors took to traveling south around Africa to get to Asia. Columbus had a different idea. By the 1480s, he had developed a plan to travel to the Indies, then construed roughly as all of south and east Asia, by sailing directly west across the "Ocean Sea," i.e., the Atlantic. Following Washington Irving's myth-filled 1828 biography of Columbus, it became common supposed knowledge that Columbus had difficulty obtaining support for his plan because Europeans believed that the earth was flat. In fact, few people at the time of Columbus’s voyage, and virtually no sailors or navigators, believed this. Most agreed that the earth was a sphere. Indeed, knowledge of the Earth's spherical nature was not limited to scientists: for instance, Dante's Divine Comedy is based on a spherical Earth. Columbus put forth arguments that were based on the circumference of the sphere. Most scholars accepted Ptolemy's claim that the terrestrial landmass (for Europeans of the time, comprising Eurasia and Africa) occupied 180 degrees of the terrestrial sphere, leaving 180 degrees of water. Columbus, however, believed the calculations of Marinus of Tyre that the landmass occupied 225 degrees, leaving only 135 degrees of water. Moreover, Columbus believed that one degree represented a shorter distance on the earth's surface than was commonly held. Finally, he read maps as if the distances were calculated in Italian miles (1,238 meters). Accepting the length of a degree to be 56⅔ miles, from the writings of Alfraganus, he therefore calculated the circumference of the Earth as 25,255 kilometers at most, and the distance from the Canary Islands to Japan as 3,000 Italian miles (3,700 km). Columbus did not realize that Al-Farghani used the much longer Arabic mile of about 1,830 meters. The problem facing Columbus was that experts did not accept his estimate of the distance to the Indies. The true circumference of the Earth is about 40,000 kilometers, and the distance from the Canary Islands to Japan is 19,600 kilometers. No ship in the 15th century could carry enough food to sail from the Canary Islands to Japan. Most European sailors and navigators concluded, correctly, that sailors undertaking a westward voyage from Europe to Asia non-stop would die of starvation or thirst long before reaching their destination. Spain however, only recently unified through the marriage of Ferdinand and Isabella, was desperate for a competitive edge over other European countries in trade with the East Indies. Columbus promised them that edge. Columbus' calculations were inaccurate concerning the circumference of the Earth and the distance from the Canary Islands to Japan. However, almost all Europeans were mistaken in thinking the aquatic expanse between Europe and Asia was uninterrupted. Although Columbus died believing he had opened up a direct nautical route to Asia, in fact he had established a nautical route between Europe and the Americas. The route to America, rather than to Japan, gave Spain a competitive edge in developing a mercantile empire. In 1485, Columbus presented his navigation plan to the court of Portugal. The king's experts believed that the route would be longer than Columbus thought and denied Christopher Columbus’s request . He then tried to get backing from the monarchs Ferdinand II of Aragon and Isabella I of Castile, who had united the largest kingdoms of Spain by marrying and were ruling together. To keep Columbus from taking his ideas elsewhere, he was put on a salary for seven years. After continually lobbying at the Spanish court, he finally had success in 1492. Ferdinand and Isabella had just conquered Granada, the last Muslim stronghold on the Iberian peninsula, and they received Columbus in Córdoba, in the Alcázar castle. Isabella turned Columbus down on the advice of her confessor, and he was leaving town in despair, when Ferdinand intervened. Isabella then sent a royal guard to fetch him and Ferdinand later rightfully claimed credit for being "the principal cause why those islands were discovered". King Ferdinand is referred to as "losing his patience" in this issue, but this cannot be proven. About half of the financing was to come from private Italian investors, whom Columbus had already lined up. Financially broke after the Granada campaign, the monarchs left it to the royal treasurer to shift funds among various royal accounts on behalf of the enterprise. Columbus was to be made "Admiral of the Seas" and would receive a portion of all profits. The terms were unusually generous, but as his own son later wrote, the monarchs did not really expect him to return. According to the contract that Columbus made with King Ferdinand and Queen Isabella, if Columbus discovered any new islands or mainland, he would receive many high rewards. In terms of power, he would be given the rank of Admiral of the Ocean Sea (Atlantic Ocean) and appointed Viceroy and Governor of all the new lands. He has the right to nominate three persons, from whom the sovereigns would choose one, for any office in the new lands. He would be entitled to 10 percent of all the revenues from the new lands in perpetuity; this part was denied to him in the contract, although it was one of his demands. Finally, he would also have the option of buying one-eighth interest in any commercial venture with the new lands and receive one-eighth of the profits. Columbus was later arrested in 1500 and supplanted from these posts, which led to Columbus's son taking legal action to enforce his father's contract, who was also arrested. Many of the smears against Columbus were initiated by the Spanish crown during these lengthy court cases (pleitos de Colón). A ship replica of the Santa Maria. A depiction of Columbus claiming possession of the New World in a chromolithograph made by the Prang Education Company in 1893. On the evening of August 3, 1492, Columbus departed from Palos with three ships; one larger " Carrack", the Santa Maria and two smaller " caravels", the Niña and the Pinta (The ships were never officially named) . The ships were property of Juan de la Cosa and the Pinzón brothers ( Martin Alonzo and Vicente Yáñez), but the monarchs forced the Palos inhabitants to contribute to the expedition. Columbus first sailed to the Canary Islands, which was owned by Castile, where he restocked the provisions and made repairs, and on September 6, he started what turned out to be a five-week voyage across the ocean. Land was sighted at 2 a.m. on October 12, by a sailor named Rodrigo de Triana (also known as Juan Rodriguez Bermejo) aboard Pinta. Columbus called the island (in what is now The Bahamas) San Salvador, although the natives called it Guanahani. Exactly which island in the Bahamas this corresponds to is an unresolved topic; prime candidates are Samana Cay, Plana Cays, or San Salvador Island (named San Salvador in 1925 in the belief that it was Columbus' San Salvador). The indigenous people he encountered, the Lucayan, Taíno or Arawak, were peaceful and friendly. Columbus also explored the northeast coast of Cuba (landed on October 28) and the northern coast of Hispaniola, by December 5. Here, the Santa Maria ran aground on Christmas morning 1492 and had to be abandoned. He was received by the native cacique Guacanagari, who gave him permission to leave some of his men behind. Columbus founded the settlement La Navidad and left 39 men. Columbus headed for Spain, but another storm forced him into Lisbon. He anchored next to the King's harbour patrol ship on March 4, 1493 in Portugal. After spending more than one week in Portugal, he set sail for Spain. Word of his finding new lands rapidly spread throughout Europe. He reached Spain on March 15. Columbus left Cádiz, Spain, on September 24, 1493 to find new territories, with 17 ships carrying supplies, and about 1,200 men to peacefully colonize the region. On October 13, the ships left the Canary Islands as they had on the first voyage, following a more southerly course. On November 3, 1493, Columbus sighted a rugged island that he named Dominica; later that day, he landed at Marie-Galante, which he named Santa Maria la Galante. After sailing past Les Saintes (Todos los Santos), he arrived at Guadaloupe (Santa Maria de Guadalupe), which he explored between November 4 and November 10, 1493. The exact course of his voyage through the Lesser Antilles is debated, but it seems likely that he turned north, sighting and naming several islands including Montserrat (Santa Maria de Monstserrate), Antigua (Santa Maria la Antigua), Redondo (Santa Maria la Redonda), Nevis (Santa María de las Nieves), Saint Kitts (San Jorge), Sint Eustatius (Santa Anastasia), Saba (San Cristobal), Saint Martin (San Martin), and Saint Croix (Santa Cruz). He also sighted the island chain of the Virgin Islands, which he named Santa Ursula y las Once Mil Virgines, and named the islands of Virgin Gorda, Tortola, and Peter Island (San Pedro). He continued to the Greater Antilles, and landed at Puerto Rico (San Juan Bautista) on November 19, 1493. The first skirmish between Americans and Europeans since the Vikings took place when his men rescued two boys who had just been castrated by their captors. On November 22, Columbus returned to Hispaniola, establishing a new settlement at Isabella – on the north coast – where gold had first been found. However, it proved a poor location and the settlement was short-lived. He left Hispaniola on April 24, 1494, arrived at Cuba (naming it Juana) on April 30, and reached Jamaica on May 5. He explored the south coast of Cuba, which he believed to be a peninsula rather than an island, and several nearby islands including the Isle of Youth (La Evangelista), before returning to Hispaniola on August 20 and then finally returning to Spain. Location of city of Sanlúcar de Barrameda, the starting point for Columbus' third journey. On May 30, 1498, Columbus left with six ships from Sanlúcar, Spain, for his third trip to the New World. He was accompanied by the young Bartolomé de Las Casas, who would later provide partial transcripts of Columbus' logs. Columbus led the fleet to the Portuguese island of Porto Santo, his wife's native land. He then sailed to Madeira and spent some time there with the Portuguese captain João Gonçalves da Camara before sailing to the Canary Islands and Cape Verde. Columbus landed on the south coast of the island of Trinidad on July 31. From August 4 through August 12, he explored the Gulf of Paria which separates Trinidad from Venezuela. He explored the mainland of South America, including the Orinoco River. He also sailed to the islands of Chacachacare and Margarita Island and sighted and named Tobago (Bella Forma) and Grenada (Concepcion). He described the new lands as belonging to a previously unknown new continent, but he pictured it hanging from China, bulging out to make the earth pear-shaped. Columbus returned to Hispaniola on August 19 to find that many of the Spanish settlers of the new colony were discontent, having been misled by Columbus about the supposedly bountiful riches of the new world. Columbus repeatedly had to deal with rebellious settlers and natives. He had some of his crew hanged for disobeying him. A number of returned settlers and friars lobbied against Columbus at the Spanish court, accusing him of mismanagement. The king and queen sent the royal administrator Francisco de Bobadilla in 1500, who upon arrival ( August 23) detained Columbus and his brothers. They had them shipped home, during which he wrote a long and pleading letter to the Spanish monarchs. They accepted his letter and let Columbus and his brothers go free. Columbus made a fourth voyage nominally in search of the Strait of Malacca to the Indian Ocean. Accompanied by his brother Bartolomeo and his 13-year-old son Fernando, he left Cádiz, Spain on May 11, 1502, with the ships Capitana, Gallega, Vizcaína and Santiago de Palos. 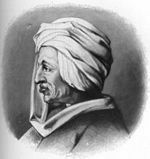 He sailed to Arzila on the Moroccan coast to rescue the Portuguese soldiers who he heard were under siege by the Moors. On June 15, they landed at Carbet on the island of Martinique (Martinica). A hurricane was brewing, so he continued on, hoping to find shelter on Hispaniola. He arrived at Santo Domingo on June 29, but was denied port, and the new governor refused to listen to his storm prediction. Instead, while Columbus's ships sheltered at the mouth of the Jaina River, the first Spanish treasure fleet sailed into the hurricane. The only ship to reach Spain had Columbus's money and belongings on it, and all of his former enemies (and a few friends) had drowned. After a brief stop at Jamaica, he sailed to Central America, arriving at Guanaja (Isla de Pinos) in the Bay Islands off the coast of Honduras on July 30. Here Bartolomeo found native merchants and a large canoe, which was described as "long as a galley" and was filled with cargo. On August 14, he landed on the American mainland at Puerto Castilla, near Trujillo, Honduras. He spent two months exploring the coasts of Honduras, Nicaragua, and Costa Rica, before arriving in Almirante Bay, Panama on October 16. In Panama, he learned from the natives of gold and a strait to another ocean. After much exploration, he established a garrison at the mouth of Rio Belen in January 1503. On April 6, one of the ships became stranded in the river. At the same time, the garrison was attacked, and the other ships were damaged. He left for Hispaniola on April 16, but sustained more damage in a storm off the coast of Cuba. Unable to travel any farther, the ships were beached in St. Ann's Bay, Jamaica, on June 25, 1503. Columbus and his men were stranded on Jamaica for a year. Two Spaniards, with native paddlers, were sent by canoe to get help from Hispaniola. In the meantime, in a desperate effort to induce the natives to continue provisioning him and his hungry men, he successfully intimidated the natives by correctly predicting a lunar eclipse, using astronomic tables made by Rabbi Abraham Zacuto who was working for the king of Portugal. Help finally arrived on June 29, 1504, and Columbus and his men arrived in Sanlúcar, Spain on November 7. During his time as governor and viceroy, Columbus ruled his domain tyrannically. Francisco de Bobadilla, a member of the Order of Calatrava, and Columbus' successor as Governor from 1500-1502, was charged with investigating Columbus' rule in the name of the Spanish Crown. His 48 page report — derived from the testimonies of 23 people who had seen or heard about the treatment meted out by Columbus and his brothers — had originally been lost for centuries, but was rediscovered in 2005 in the Spanish archives in Valladolid. It proved to contain an account of Columbus' 7 year reign as the first Governor of the Indies. According to his report Columbus was known both by friends and enemies for the atrociously harsh punishments he imposed on his subjects. Consuelo Varela, a Spanish historian, states: "Even those who loved him [Columbus] had to admit the atrocities that had taken place." A statue of the Santa Maria, Columbus' flagship in his first voyage. 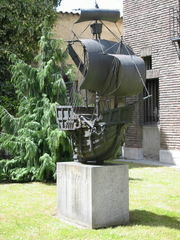 The statue is at the House of Columbus in Valladolid, Spain, the city where Columbus died. While Columbus had always given the conversion of non-believers as one reason for his explorations, he grew increasingly religious in his later years. He claimed to hear divine voices, lobbied for a new crusade to capture Jerusalem, often wore Franciscan habit, and described his explorations to the "paradise" as part of God's plan which would soon result in the Last Judgement and the end of the world. In his later years, Columbus demanded that the Spanish Crown give him 10% of all profits made in the new lands, pursuant to earlier agreements. Because he had been relieved of his duties as governor, the crown did not feel bound by these contracts, and his demands were rejected. His family later sued for part of the profits from trade with America but ultimately lost some 50 years later. 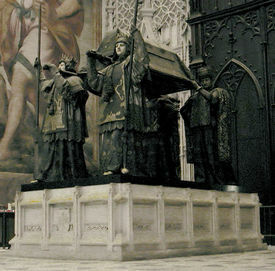 Columbus' tomb in the cathedral of Seville. It is borne by four statues of kings representing the Kingdoms of Castile, Leon, Aragon, and Navarre. On May 20, 1506, Columbus died in Valladolid, fairly wealthy from the gold his men had accumulated in Hispaniola. He was still convinced that his journeys had been along the east coast of Asia. Following his death, his body underwent excarnation—the flesh was removed so that only his bones remained. Even after his death, his travels continued: first interred in Valladolid and then at the monastery of La Cartuja in Seville, by the will of his son Diego, who had been governor of Hispaniola, his remains were transferred to Santo Domingo in 1542. In 1795, the French took over, and his remains were removed to Havana. After Cuba became independent following the Spanish-American War in 1898, his remains were moved back to the Cathedral of Seville, where they were placed on an elaborate catafalque. However, a lead box bearing an inscription identifying "Don Christopher Columbus" and containing fragments of bone and a bullet was discovered at Santo Domingo in 1877. To lay to rest claims that the wrong relics were moved to Havana and that Columbus is still buried in the cathedral of Santo Domingo, DNA samples were taken in June 2003 (History Today August 2003). Results announced in May 2006 show that at least some of Columbus' remains rest in Seville, but authorities in Santo Domingo have not allowed the exhuming of the body. Columbus is often viewed as a hero, and also of faith by most in the United States because of his pivotal role in U.S. history. He has had a cultural significance beyond his actual achievements and actions as an individual, becoming a symbol and figure of legend. Numerous stories about Columbus have cast him as an archetypal figure for both good and for evil. While other discoverers and immigrants had come to the new world of the Americas before Columbus and it had already been "discovered" many times, Columbus's impact and significance in history has more to do with his time and its effects. His journey came when technical developments in sailing techniques and communication made it possible to report his voyages easily throughout western Europe. In this way Europe was reacquainted with the Americas, and this was followed by many more voyages seeking wealth and expansion. The nascent countries of the New World, particularly the newly independent United States, seemed to need a historical narrative to give them roots. This narrative was supplied in part by Washington Irving in 1828 with The Life and Voyages of Christopher Columbus, which may be the true source of much of the associations held about the explorer. Hero worship of Columbus perhaps reached a zenith around 1892 when the 400th anniversary of his first arrival in the Americas occurred. Monuments to Columbus like the Columbian Exposition in Chicago were erected throughout the United States and Latin America extolling him. Numerous cities, towns, and streets were named after him, including the capital cities of two U.S. states (Columbus, Ohio and Columbia, South Carolina). The story that Columbus thought the world was round while his contemporaries believed in a flat earth was often repeated. This tale was used to show that Columbus was enlightened and forward looking. Columbus' apparent defiance of convention in sailing west to get to the far east was hailed as a model of "American"-style can-do inventiveness. The admiration of Columbus was particularly embraced by some members of the Italian American, Hispanic, and Catholic communities. These groups point to Columbus as one of their own to show that Mediterranean Catholics could and did make great contributions to the U.S. The modern vilification of Columbus is seen by his supporters as being politically motivated. A bronze statue of Columbus sits among the flowers and trees of Belgrave Square, London. Very high on the list of those expressions of non-indigenous sensibility which contribute to the perpetuation of genocidal policies against Indians are the annual Columbus Day celebration, events in which it is baldly asserted that the process, events, and circumstances described above are, at best, either acceptable or unimportant. More often, the sentiments expressed by the participants are, quite frankly, that the fate of Native America embodied in Columbus and the Columbian legacy is a matter to be openly and enthusiastically applauded as an unrivaled "boon to all mankind." Undeniably, the situation of American Indians will not—in fact cannot—change for the better so long as such attitudes are deemed socially acceptable by the mainstream populace. Hence, such celebrations as Columbus Day must be stopped. Columbus' colonization of the Americas, and the subsequent effects on the native peoples, were dramatised in the 1992 feature film 1492: Conquest of Paradise to commemorate the 500th anniversary of his landing in the Americas. In 2003, Venezuelan President Hugo Chavez urged Latin Americans to not celebrate the Columbus Day holiday. Chavez blamed Columbus for leading the way in the mass genocide of the Native Americans.